In order for your Aerated Wastewater Treatment System (AWTS) to maintain optimum performance, NSW Health requires that your AWTS is serviced every three months. When you purchase a BioSeptic wastewater treatment system, the first year’s service is included in the price. Ongoing service of a BioSeptic system is an extensive process of checks and tests performed by trained BioSeptic technicians to ensure each BioSeptic system is operating correctly after every service. We know our systems inside-and-out, so we are are able to solve any issues quickly and without hassle. We’re committed to serving and supporting you long after your tank has been installed. 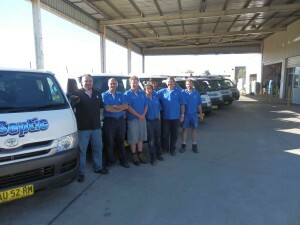 Our dedicated service division is staffed by technicians keen to help you. Calls made outside business hours are captured by our paging service with a response made in the morning of the following business day. On weekends, we will return your call to discuss any problem you may have with your system.